Students are often confused when it comes to choosing the right career choice for them. They generally look for other sources of information to satisfy what they eagerly need to know for pursuing higher education. According to Research, 64% of Students rely on the social media platform to learn more about institution or university. 84% of Students first visit the institute website. These statistics are very vital to understand students’ behavioral pattern when it comes to choosing the best institute for them. What if an institute leverage the power of digital media to engage aspirants and convert them into probable candidates for admissions. The campaign will give you insights as to how a unique social media approach changed the game. To increase the number of applications. To increase overall reach and connect with potential candidates. Run a campaign to reach out to a potential candidate and increase the number of applications for a different course offered. Social Media buzz created by course promotional post. Highlighting the benefits of course offered. Highlight the various coursed offered and why one should join or take the course. Institute needs to get insights into conversations, engagement, revenue, and cost-saving campaigns, and half of the battle is won. Social Media campaigns are among the best cost-saving way to reach the right audience. 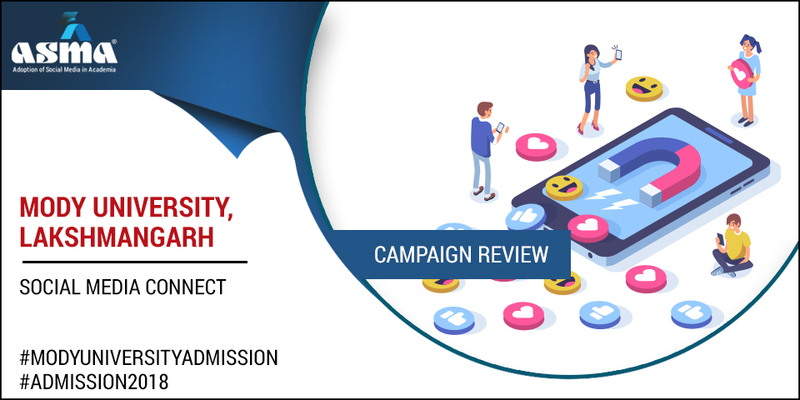 The campaign was aimed to connect with aspirants over social media, creating awareness about the course offered by the university and how any query related can be solved to course can be solved. The approach was clear with regard to sharing the post on social media and time of posting. It is always important to understand your target audience and offered what they are willing to take in consideration. The course was segmented in bachelor, Postgraduate and other programs. And accordingly, social media buzz was created. Created a social media buzz and posting on comments thereby engaging more people. They have posted course promotion post over Facebook Page especially focusing on the area of interest class of candidates. The Facebook page is active to engage the audience and inform the aspirants about the new course offered and date and time of applying. The post contains the registration link, application submission, and banner that depicts the objective of the post. The buzz was created and resulted in larger participation and engagement over the post. Twitter is prominent among age group 18 to 29, thereby choosing the twitter for reaching out the target audience is probably the right decision for an Institute or University. Mody University has created several posts regarding the key benefits of the course offered. Posts were of different categories, some of them were about Bachelor of Science Travel and Tourism, some of them were of advanced courses like forensic science. It’s a real differentiating factor that whatever campaigns an institute on regular basis, sharing the achievement of the past makes it more reliable and accelerate the overall engagement rate. The post on Instagram was a cross-promotional post of Twitter and Facebook. The reason behind choosing Instagram was to rich out to a large number of right audiences, the engagement rate of Instagram was quite high.